20, of Cumberland, Maine; assigned to the 1st Battalion, 17th Infantry Regiment, 5th Stryker Brigade, 2nd Infantry Division, Fort Lewis, Wash.; died Aug. 31 in Shuyene Sufia, Afghanistan, of wounds sustained when enemy forces attacked his unit with an improvised explosive device. Also killed were Spc. Jonathan D. Welch and Spc. Tyler R. Walshe. 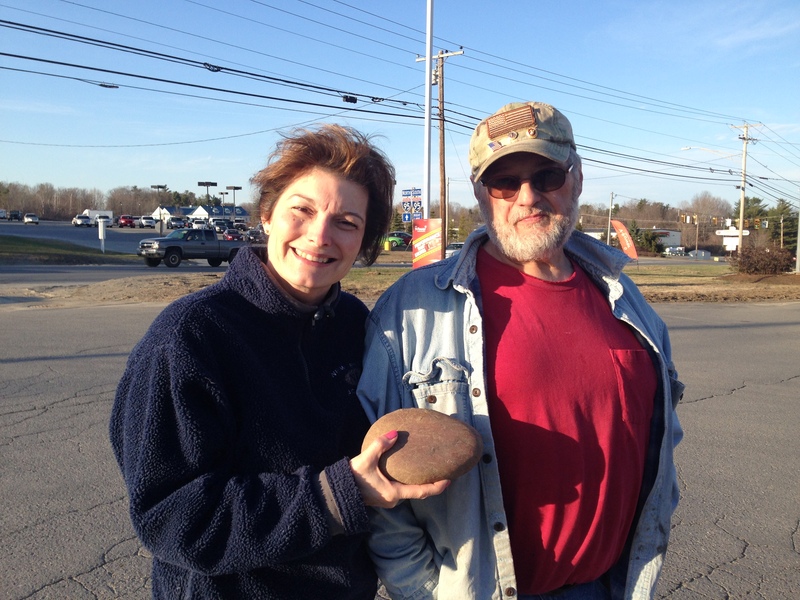 To honor PFC Jordan Brochu, his mother, Suzanne Brochu retrieved this stone from a stream bed in Bethel, Maine, one of Jordan’s favorite places to visit with his family. Suzanne Brochu describes why this stone is significant and what it says about her son Jordan. Hi Suzanne. My name is Catherine Gordon and it was my honor to transport Jordan’s stone on the last two legs of the motorcycle ride to the Summit Project Memorial Day weekend. As I carried Jordan’s stone, I thought of him and how you said he liked adventure and how much this particular stone meant to him. I wish you could have seen the streets of Medway and Millinocket lined with people waving American flags and signs as we rode by to show respect and honor your son. It was amazing to see the support that the Maine community showed. I am so sorry for your loss. He will never be forgotten! My heart swells with great pride and I would like to thank you for allowing me to honor Jordan’s memory by carrying his stone to the summit of Mt. Katahdin to lift up the life of your son. As you know your son and I share a special heritage, a common bond, we practiced the same Army values: loyalty, duty, respect, selfless service, honor, integrity, and personal courage. My team and I stepped off that saturday morning at 0800. Katahdin was still snow covered and suffered severe rock slides on Abol trail, so the decison was made by the BSP Rangers that we would climb Owl Mountain which has an elevation of 3670‘ and is the first in a chain of mountains west of Katahdin. The trail to Owl Mountain started at Katahdin Stream campground. The first mile followed the hunt trail before it split to the owl trail which climbed gradually most of the way. After two miles into the hike hands were needed to climb the steeper spots. Each step I took while ascending the mountain I carried with me the story of your son, and as I struggled to navigate the rocky terrain the thought of Jordan was always there, and his memory pushed me through the last climb. The vegetation started to thin and we were taking on amazing views of Katahdin while looking across the sheer cliffs of Owl Mountain. Through parts of the hike you could hear the roar of Katadhin stream, it would remind me of the story you told of your son. Thank you for sharing Jordan’s memory with me and the TSP. I volunteered for this to make sure that soldiers like Jordan are never forgotten. This day will always have a special place in my heart. I had the honor of carrying his stone up the mountain and I must say that it was a touching experience. His sacrifice is appreciated and I can’t imagine how much it hurts to lose a son. I realized at the summit that I never fully knew how much a soldier had to sacrifice in order to keep me safe. I feel as though he is part of my family. You said that he was into adventures and climbing that mountain seemed like something he would have enjoyed immensely. I’ve learned in class about the reasons of war and it has really changed my perspective of war. Sometimes when we view war soldiers are viewed as a statistic and I feel as though that’s wrong. Soldiers are dragged into the battlefield to fight for political reasons and they don’t deserve that. I got involved in the Summit Project because of my English class. We were learning about war like topics in class and even reading war books. My teachers proposed the field trip of climbing a mountain for the service men of Maine. Right away I was excited in doing this project and learning about my service member. Finding out that I had your loved one, Jordan M. Brochu and reading about him made me like him. I love being outdoors and when others enjoy it as well it reminds me that there are still some people out there that do like the outdoors more then the indoors. It restores my faith in society. He seemed like a great man and friend to all. Carrying his rock up that snowy cold mountain was an honor of mine. I thought of how he would of loved to be climbing that mountain with us. How he would been finding gems everywhere. It could have been a blizzard that day and I still would have carried his rock to the top because I know he sacrificed it all to keep this county safe. He gave it up for all of us and it was mine turn to repay him. Once I reached the top with all of my classmates it was a beautiful sight. Everyone carrying rocks said a few words to honor the soldiers who died fighting for us. It was a moment in my life like no other. I can’t even explain the feelings I had at the top. It was definitely an overwhelming experience. I was honored to carry his rock to the top and may he rest in peace. Participating in The Summit Project was a true honor to be a part of. The privilege to join in bringing recognition to our fallen soldiers was an experience unlike any other. Carrying Jordan Brochu’s stone meant I was also carrying a symbol of his life, and all that he was. This public commemoration was far from being a mere walk… it was an honoring display of remembrance for our soldiers to the community. Talking with my friend, Suzanne Brochu, about Jordan and what she would like to highlight regarding his life and service, I could feel the weight of the loss for their family. I remembered the early days of despair and unbelief when the news of Jordan’s sacrificial death was disclosed. I saw they pain and anguish then, as well as on any familial anniversary or on Memorial Day celebrations and days of remembrance of our Military. The weight of remembering and recognizing Jordan’s sacrificial service and their loss continues to be a very painful part of this precious family’s existence. I carefully approached my friend and asked first for permission to ask Jordan, letting her know that it would be alright if she chose not to. As she painfully shared with me what I asked for, I could feel the conflict of emotions; she desired to give me information in order to honor her son, but she also was weighted down, once more, with grief in the recounting. Not being very physically active, I knew I would have to rely on my Lord to physically be able to complete the 6.5 miles of the walk, which was insignificantly similar to how the Brochu family have endured the loss of Jordan. I carried the emotional weight of their loss with me through the weeks and days following my talk with Mrs. Brochu. Knowing that Jordan himself had chosen the rock which now bears his rank, name, and lifespan, I knew the trek would be a much more emotional journey than I had anticipated. Being able to share the experience with my daughter, my child, honoring the loss of my friend’s child, was very powerful and humbling. I will be forever grateful for the respectful way in which the The Summit Project honored the Brochu family’s loss, and to Jordan’s sacrifice on behalf of our country. I will always remember this time with other volunteers, the organizers, the memories shared of other fallen heroes and their families, and the honoring ceremony that followed our trek. I do not think I can fully put into words how deeply I have been changed by this experience. I praise God for Jordan, for the Brochu family, for the living memorial which is The Summit Project, the experience shared with my daughter, and for my Lord upholding me to be able to physically complete the course. There are no words that can fully express our heartfelt sorrow for your loss. This past weekend I had the pleasure of carrying your son’s stone up to the summit of Owl. It was an honor for me. The whole time I was remembering his strong sense of adventure, his tough childhood, and his involvement in school. Jordan graduated from the same high school that I will be graduating from in a couple of weeks. Throughout my years I have made sure to be very involved, and even though Jordan was only at LRHS for one year, I know he also did this. I respect him immensely for that, especially after the hardships he overcame as a child. When I spoke to my boyfriend about your son, he told me that he met him once. They went through the same culinary program (at different times). My boyfriend, Joey, told me of how good-natured and kind your son was. He told me of the good remarks the teacher had about him, as well. Joey said that your son was “going places.” That made me incredibly sad to hear. However, when I think about it now, I know that your son DID go places. He gave the ultimate sacrifice for his country, and I know that you are eternally proud of him even though he is no longer with us. An article written about his passing was titled, “Jordan Lived a Lifetime in 20 Years.” From what I see, this could not be more true. I only wish I could have met you this past weekend. I would love to learn more about your son. His story will stay with me forever and especially as I go off to college this fall. I will strive every day to exemplify some of the characteristics he had as an honor to both him and you. If you would like to get in touch, do not hesitate. I don’t remember the first time I heard about TSP but when I did I was curious what it was all about and stated reading more about it. I was very intrigued and interested in getting to see the Tribute case. The first time I got to see the case was at USM when I was taking a class for work. I was immediately touched and impressed. I knew one of the Soldiers that had his stone there and also read all the others noticing Jordan’s Stone because of his age. Thinking to my self 20, such a young age to die and thinking that I was doing the same thing when I was 20 and in the Army, but there was no war going on at the time. When I heard that TSP was coming to Lincoln I knew I had to be a part of the march, because I grew up in the area and love the Cause and what it stands for. When I was assigned Jordan’s Stone I started doing my research and saw his picture and thought it looked familiar and later realized it was because I had seen it at USM. It was great getting to know Jordan a little while doing research and hearing he was a good athlete in High School and was adventurous as am I. Also learning he was part of the 2ND Infantry Division, the saying always goes Brothers in Arms. Even though it has been many years since I was in the Army there is always that Pride and Brotherhood in the Units and People you served with along with those that came before and after you. I loved to read about Jordan adventurousness and going to the western part of Maine to go gold panning and doing some Mining for other minerals. I have never done either of these but have always wanted to spend some time in the western part of the state so I see myself making a trip in Honor of Jordan. Hopefully I will be able to share the experience of my trip when I am able to, Just being in the same stream where he liked to Pan or even in the same area where he liked to Pan hopefully will help keep his adventurous nature and Memory alive. Thank you for allowing me to Carry Jordan’s stone and being part of TSP. I had the honor of carrying Jordan’s stone at TSP at ANP. I was given his stone at the last minute but felt like I needed to be the one to carry it. After the climb was when I really started to learn more about Jordan. And the small connection we share. I too grew up playing and fishing in the Swift River. I find it amazing that he and I may have been in the same spot some years ago and never even know one another yet years later find the connection. A true Maine hero who I will always remember. Thank you for your service to this great country. MHANF and Jordan will live forever because of TSP. To the family of Jordan – I had the honor of carrying Jordan’s stone on my motorcycle from Portland to Baxter this year. I was immediately touched by the fact that he has the same name as my only child. I lost my husband suddenly last August 23 to a sudden heart attack and a friend from my home town died the day before in Afganistan. I spent the ride reflecting on the loss you feel, the loss I feel and the fact that I was sure that my husband Tony has found Jordan in heaven and they were watching me together as I honored Jordan’s memory and sacrifice. I posted on Facebook about my experience carrying Jordan’s stone and I was surprised to get a message from a close friend of mine who is a funeral director at Knowlton Hewins Roberts Funeral Homes where I worked for a few years . He told me that Jordan’s services were held by them. They are the same funeral home I used for my husband although we lived in Southern Maine. I wanted my friends to care for him. It brought tears to my eyes to think the same loving people also cared for your son. It’s a small world. Carrying your son’s stone was a life changing event for me and I will always cherish the honor. Know that my husband Tony will be watching over him in heaven and his sacrifice will never be forgotten by me or my family here on earth. My love to you. This year on Memorial Day, on my first [real] hike in Maine, I was accompanied by Jordan as I climbed the mountain. Carrying the weight of that stone was an interesting experience. When you first put on the weight, you felt it immensely. Then as you move through life, it becomes part of you and your journey. And when you put down the backpack, you release the weight and feel it lifted, but still think about it and remember it. This is as close as I can imagine to signing up for the Army. The immense weight you and your family must feel as you sign up, it then becomes part of your life, and even when you are back and free of the weight, it never leaves you. I thought a lot about Jordan and his story, but one thing that struck me was that he was so, so young. But I’d read a lot about him, and it seems like he had a complete life, even one that was so short. I’m thankful for that, for he and his family. One thing that struck me about the stone, that I didn’t even think about until we were hiking the mountain, was the story about how it was found. It was found on a rainy day, and his mom talked about the immense beauty that was revealed only in the rain. That day on the mountain, I found myself in the middle of a giant raincloud. It was a unique experience, because I don’t think many people have done a major hike in a lot of rain. And I thought about how the rain made the beauty around us stand out. It made everything clean, quiet, and when we came above the fog, it was a completely unique view that most hikers wouldn’t see. It reminded me a lot of Jordan and his stone, and I carried that thought with my about the natural Maine beauty. I’m thankful to know Jordan’s story, and I hope his family knows that I have had created memories that he is a part of, even though he is gone. Thank you for sharing his stone, his story, and his strength. Saturday, October 1, 2016, I had the honor of summiting Army Pfc. Jordan M. Brochu’s stone on Cadillac Mt. They day started off early but I learned early on that Jordan “lived a lifetime in 20 years”. I did not know Jordan but I wish I had. The world does not have enough of him. He was unique and as I learned more about him, I am proud and grateful that he went to fight for others. Jordan came from a long family line of veterans who didn’t hesitate to lead, help and fight for others all across the world. It was easy for Jordan to fallow in their footsteps. Without hesitation nor regret. Jordan was a bright young man who could of taken what he learned growing up from sportsmanship, team comradery, a high school career and education to family and friends to do just about anything in this world but he chose to enlist in the Army. Its young men and women like Jordan who make it possible for my son and I to live in a free country. To hike mountains, have careers, raise a family and many many more things in life. Without Jordan and his sacrifices we have nothing. I am forever grateful for this man. I learned that Jordan enjoyed nature walks with his Mother, Suzanne. That they would collect stones from river beds. Much like Jordan’s memorial stone that I took with me on my journey. As I embark on future hikes with my own son, I will take a piece of Jordan’s memory with me. I will never forget this young man and all the sacrifices he made for me, my own family, his own family and our nation. I had the honor of carrying your son’s stone up Streaked Mountain. The privilege to bring recognition to our local fallen soldiers was an amazing experience. As I carried the stone, I thought of the sacrifice Jordan made, and how the pain of climbing the mountain is nothing compared to that sacrifice. The stone is more than just a stone. It’s a representation of him, his life, and his duty. “There is no greater love than to lay down one’s life for one’s friends.” Jordan’s service and sacrifice to this country will not be forgotten. It would have been an honor to meet him. After hearing about the stream bed from where the rock was retrieved from, and finding a small stream not far off from the summit reminded me of him, and how the stream was one of his favorite places. The view from the top of the mountain during the peak of Maine fall foliage was beautiful and peaceful. It was a time to take a step back and reflect upon the sacrifice of Jordan’s service, and all soldiers service and sacrifice. Jordan’s sacrifice to preserve freedom in the United States will not be forgotten. His courage, integrity, and selfless service are an example to not only me, but all civilians in America. I had the honor of representing and presenting the life and service of Jordan in front of my classmates. Thank you for letting me carry Jordan’s stone up the mountain. And thank you for his service to our country. He will never be forgotten. Words are just not enough to describe how honored I was to be able to carry PFC. Brochu with me on veterans day and two days later on a four mile run. I know that Jordan loved to collect rocks and mine for gems, my three year old son is always wanting me to help him move rocks and dig them up, but know when we go rock collecting or I have to dig them out of my son’s pants pockets I will for ever think of Jordan and how humbleing It was to get to carry his stone for a weekend. Thank you PFC JORDAN FOR MAKING THE ULTIMATE SACRIFICE. On November 20, 2016, I carried the stone and story of PFC Jordan Brochu to the summit of Bradbury Mountain in Pownal. It was a dreary and rainy day. I imagined it to be much like the day when his stone was “found.” Without the rain, I would not have witnessed the subtle beauty of the stone, as described. What an honor! PFC Jordan M Brochu is not forgotten! My name is Ivan Bates. I am currently attending Nokomis Regional High as a sophomore. The program JROTC allowed me to participate in the summit project to carry stone chosen by the families of fallen soldiers of maine. We hiked the mountain Little Bigelow and had the honor of carrying the stone of PVC Jordan Brochu to the summit. The hike was a challenging climb at points but i enjoyed it knowing what i was doing it for. While i did this i learned that many fallen soldiers are forgotten and we aren’t made aware of their deaths. I feel like this program was good for us and for the soldier’s families to show that they aren’t forgotten. It was truly an honor. As summer transitioned to fall this year, I had the pleasure of taking Jordan’s stone to the top of Cadillac Mountain in Acadia. It was a dreary, windy day on the mountain but we were fortunate enough to avoid any rain. I thought that it was fitting weather for the occasion and it reflected the mood of the group as well. I don’t know if I received Jordan’s stone out of luck or by design, but I’m very glad either way. I think that he and I have a lot in common, from our reasons to join the military to our hobbies and interests on the side. I believe I would have become good friends with him if fate had been more kind. Brochu and I served in the very same region in Afghanistan as well. A seemingly endless, flat expanse of “moon dust” sand which transitioned into shale, rocky mountains. Climbing Cadillac Mountain really brought back those memories for me – it felt almost as if I was back on patrol. I reflected on how lucky I was to be able to climb the mountain that day and I felt forlorn over what the hike represented. I feel guilty every day that I, by some stroke of luck, am allowed to walk freely on this earth, enjoying scenic hikes and living my life according to plan. While men like your son are tragically ripped away from us. I hope that by carrying his stone I can bring you some element of solace. Jordan is gone forever, but his memory will live on through me until my dying day. Thank you for your continuing sacrifice for this country and may Jordan rest in peace. Over Veteran’s Day weekend I had the honor and privilege of participating in a local Summit Project event, and proudly carrying the stone and story of your beloved Jordan. On the morning of Veteran’s Day, in the biting wind and frigid temperatures, I carried Jordan’s stone to the summit of Blue Hill Mountain. There I proudly told my fellow hikers all about Jordan – about his amazingly full life in his short twenty years, and his ultimate sacrifice for our freedom. The following day, I ran with Jordan’s stone in the Veteran’s Day Remembrance Race. It was another chilly morning but a great day for a run. As I ran the 4 miles along the river, I passed Jordan’s stone back and forth between my hands, acknowledging the weight in my hands and realizing that it pales in comparison to the weight in your hearts. I am so sorry for your loss. After the race I held onto Jordan’s stone for as long as possible before reluctantly returning him to the table with the other stones. I didn’t want my time with him to end. When I found out that I would be honoring Jordan’s memory and carrying his stone, I set out to find out as much information as I could about him. I learned that he loved to learn and to laugh. And he loved to cook – particularly baking cookies. Jordan was adventurous and approached everything he tried with passion and determination. My friend Joelle, who coordinated the event, had told me that I was sure to find some connection to him – and I certainly did. Jordan went to the same high school as my mom. He has been described as a born leader who made friends easily – traits I identify with completely. I too love to learn, and to laugh. And baking cookies. But the most special connection was found on the TSP site, where Suzanne, you shared that, “to Jordan, every rock was really a gem.” My oldest daughter, Olivia, who is just shy of four years old, feels the same way. She is always finding special rocks, excited to show them to me and explain why she finds them so beautiful. In my laundry room, I have a collection of her treasured rocks, her “gems”, that make it into her pockets throughout the day. Jordan’s short, but amazingly full and vibrant life, and his ultimate sacrifice, are forever etched in my heart. And I know I will think of him every time my daughter hands me a precious gem. I have thought of Jordan every day since that weekend. I may not have Jordan’s stone in my hands now, but I will carry his memory in my heart and mind always. Thank you, Jordan, for your ultimate sacrifice. Thank you Gold Star family members, for sharing Jordan’s story with us. My name is Marian, and I am a sophomore at Nokomis Regional High School. I love camping, hiking, swimming, riding horses, and really anything that allows me to have an adventure. I had the honor of carrying Jordan’s stone up Tumbledown Mountain on June 8th with my fellow Nokomis JROTC sophomores. It was a very good and thoughtful experience that allowed me to think about a brave man who gave his all for our country. The mountain had a summit of 3,054 feet, and we were able to climb on an absolutely gorgeous day. There were moments, at the top, when the wind would die down and it was very serine. This was always a reminder as to why we had climbed over slippery rocks, knotted roots, and through the woods. It was a very enjoyable climb that never let me forget why I was there. There is a pond about 0.6 miles from the summit where we had a chance to go fishing, and we spotted some fish eggs. Someone fell in, someone else got hooked by a fly, but overall most everyone stayed unscarred and dry. While learning about Jordan, the thing that struck me most was how young he was when he passed. My brothers are both in their mid- twenties, and I couldn’t imagine not having them around. It’s an absolutely horrible thing to lose a loved one, and I feel very honored to have carried his stone, and to have remembered him. This experience will forever stick with me, and I hope that these Maine soldiers never are forgotten. It was with great honor that I was able to hike with Jordan’s living memorial stone this past weekend on October 28, 2018. It was a dream of mine to introduce our Boy Scout Troop 304 to the Summit Project and to hike with as many in our troop as possible. We had a total of 19 boys and adults hike in Evan’s notch on the Deer Hill loop in the fog and rain and three to four inches of new snow from the night before. It was not an easy hike for many as the trails were slick in places and there were some challenging steep slopes both on the way up and down. I’ve had the honor of opening the envelope of Army PFC Jordan M. Brochu and learning about his sacrifice he has made for our great country. I em employed at Penquis in Bangor, Maine and the Summit Project Honor Case has been placed in one of our lobbies. It warms my heart that these fallen soldiers are still being honored and I am proud to have learned about this wonderful young man. My heart weeps for his family and loved ones and I want to personally thank Private Brochu for all he has done for our freedom. I also have loved to collect stones on my adventures and find great meaning and significance in them as well and like to share them with others. Suzanne I want to thank you for sharing your story with us and hope this project continues to honor our fallen soldiers. God bless you and rest in peace Jordan.